The ritual began at Gyu-Kaku in Torrance, California (Japanese BBQ) where we feasted upon grilled flesh until the gods of food told us to stop, at which time we proceeded on our journey to the Fox Theater in Pomona to witness the almighty Manowar perform as part of their Kings Of Metal XXIV tour. There were also no opening bands, which I think helped to keep the posers away. 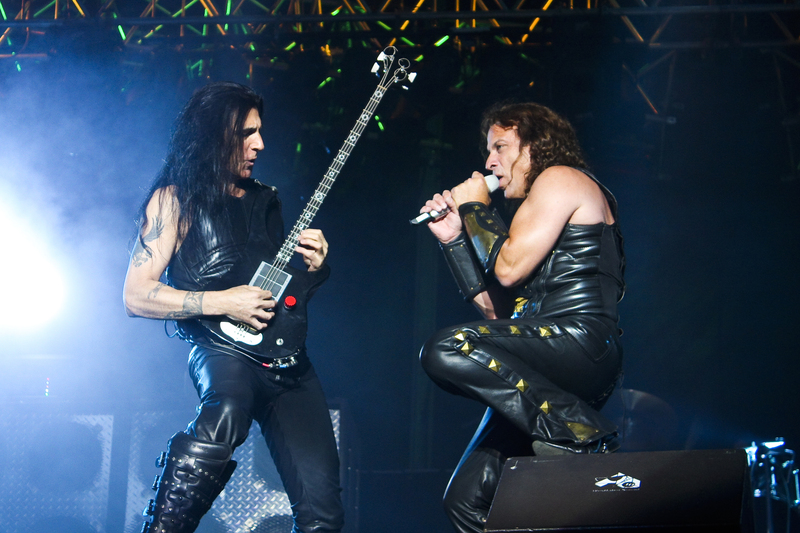 Upon entry to the stage area, Southern California’s Army Of Immortals were greeted with giant video screen backdrops displaying the band’s logo and the almighty speakers that bassist Joey DeMaio and guitarist Karl Logan would blast through. 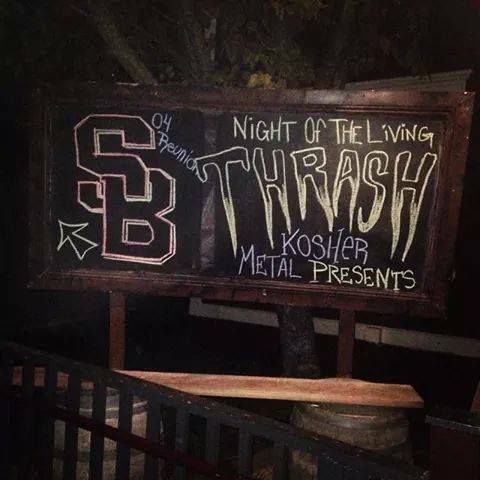 Those video screens would later display killer background imagery along with occasional video vignettes documenting the band and the recording of Kings Of Metal XXIV. There was also a cool little tribute to “fallen brothers” which included people such as Richard Wagner, Ronnie James Dio, and former Manowar drummer Scott Columbus. The band opened with their autobiographical song ‘Manowar’ from their debut album Battle Hymns and followed those with ‘Blood Of My Enemies’ and ‘Sign Of The Hammer’ – vocalist Eric Adams was sounding amazing as always so this was definitely shaping up to be a great Manowar show. Suddenly, after the third song, we were all presented with the dreaded “technical difficulties” dilemma and had to wait a little while for things to be rectified. After a little bit of waiting, the band returned to the stage to continue the show without any further issues. The energy at this show was incredible, the best crowd I’ve seen at a Manowar show…and it’s about time! I had seen them twice before in Southern California over the years and the shows weren’t as packed as they should have been, so it was great to be a part of this adrenaline inducing event. Last night was an incredible experience for me. 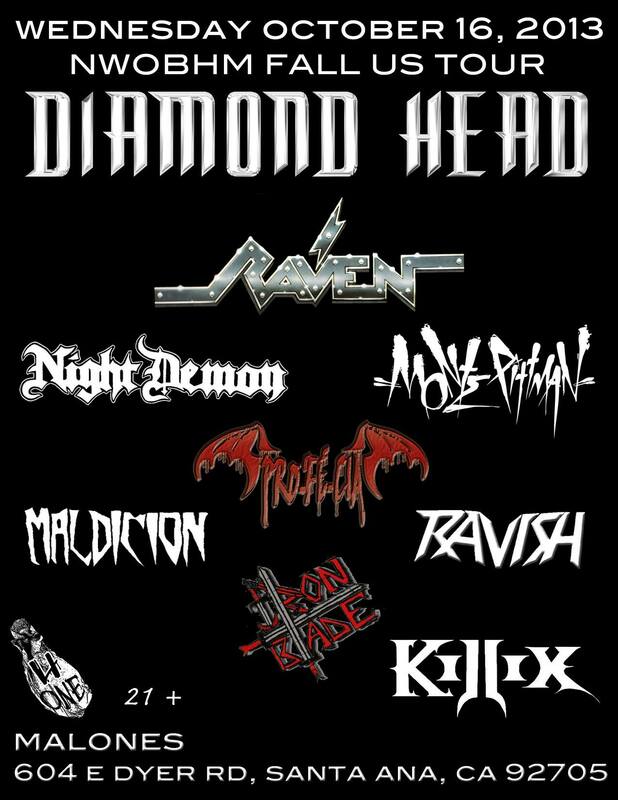 I got to see NWOBHM legends Diamond Head along with Raven and new favorites Night Demon in a small club called Malone’s in Santa Ana, Ca. Even though I was having some insane upper back pain, I was determined to see this show and I’m so glad I did. There definitely could have been more people there, but it was a weeknight and things were running behind as Diamond Head went on about an hour late at around 12:45am or so (they were supposed to be on at 11:40). However, despite the recipe for a bruised ego, these bands played as if the place was packed. The wife and I arrived shortly after Raven started their set on the main stage. I must admit I’m not as familiar with this band as I should be, but those guys definitely put forth a lot of energy and impressed me for sure. For being a trio, there was a lot of power being put forth from these guys. Let’s face it, they aren’t exactly young anymore; yet they put forth more energy than I see from some of the younger bands today. And those screams….holy crap! I had to look around to see if glasses were shattering at times. I must admit I’m not a huge fan of the shrilly King Diamond-like screaming, but I know that isn’t exactly easy to do consistently and takes quite of bit of talent to pull of right. So they still get the horns up from me. 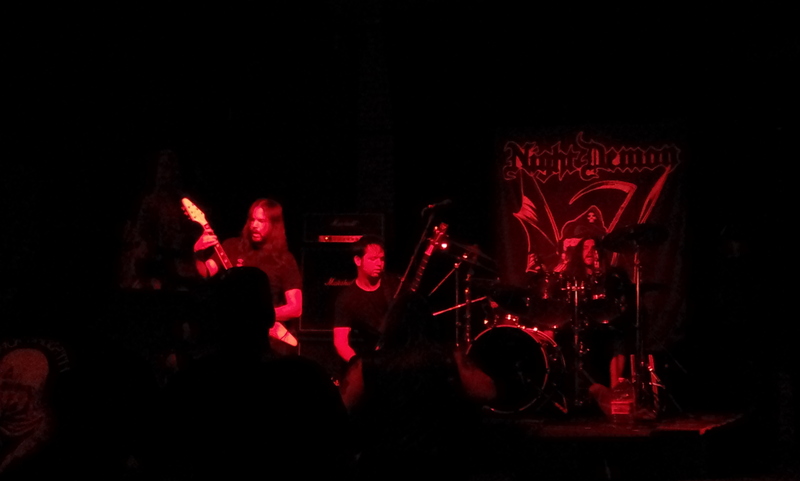 When it came time for Night Demon to play the bar stage in between Raven and Diamond Head, I was pumped. I am thoroughly familiar with their current four-song release but shorty before they began it occurred to me that I might get to hear some new songs, which I did. They played three songs that I heard for the first time; ‘Heavy Metal Heat’, ‘Satan’, and another one they didn’t say the title of. Based on those songs, I cannot wait until they come out with their full-length release next year. However, I do think that the band might benefit from having another guitarist at live shows. In no way am I saying anything bad about how it sounded, I just think an added rhythm guitarist would add to the sound and make them even more amazing then they already are. Regardless, they put on a great show. 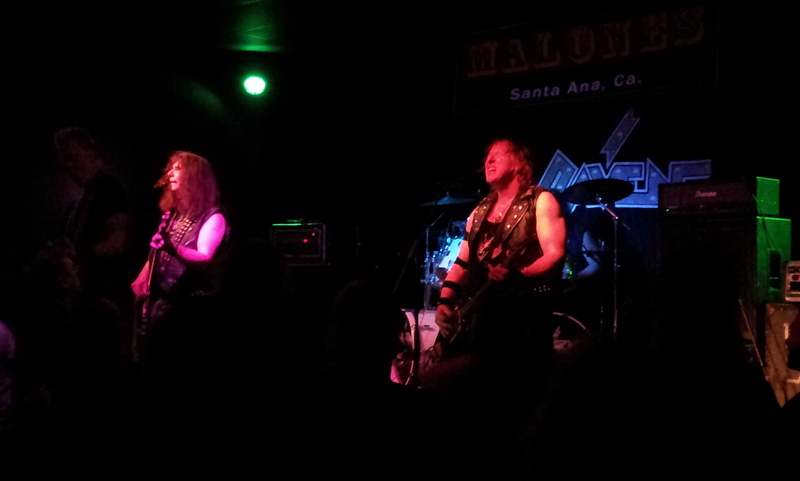 As for Diamond Head, I was completely blown away. 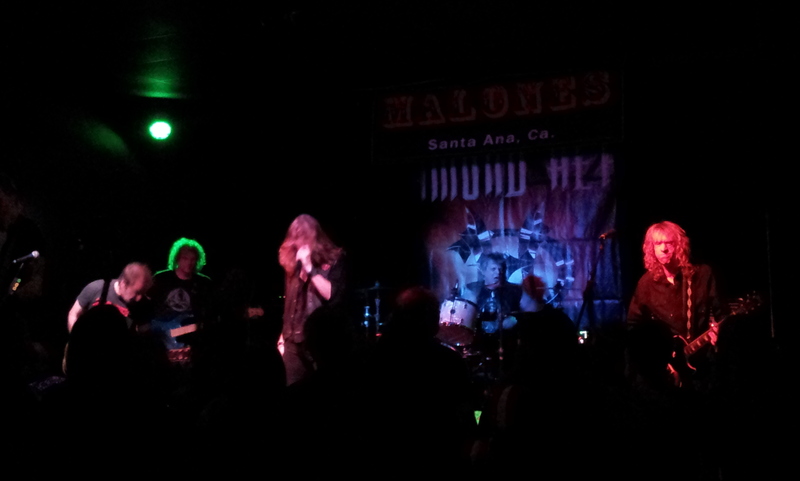 Even though the band was without their usual frontman Nick Tart, their fill-in vocalist Chas West threw it down better than any vocalist they’ve had in the past. Of course, that’s just my opinion. Regardless, anyone who may be skeptical about seeing these guys with a fill-in vocalist needs to quit worrying because I guarantee they won’t be disappointed. They played all the songs one might expect from these guys; ‘It’s Electric’, ‘Helpless’, ‘Sucking My Love’, ‘Lightning to the Nations’, ‘Am I Evil?’, etc. The band had great energy and Chas added an element to the band that is nothing but positive. You can check out multi-cam footage of them performing ‘Am I Evil?’ in San Francisco below along with the remaining dates on the tour. Special thanks to Jason at Homeless One Productions for his hospitality.